Recently, my Lenovo laptop (running Windows 10) has started failing to shut down properly. When I click on “Power/Shut down” the laptop shuts down and then reboots back to the login screen. I tried shutting it down just using the power button, but exactly the same happened. 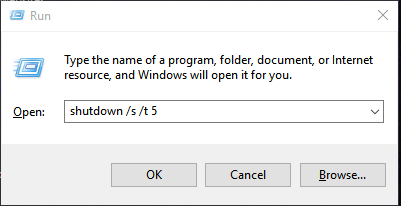 Hold down the Windows key and hit R then shutdown /s /t 5 in the Run field (note the spaces between “s” and “/” and “t” “/”). Then hit the Enter key. A few seconds later the laptop shut down and stayed shut down.